It’s (Not) In My Hair! Rainy days are a special treat when you live in the desert. Summer has assaulted you from all sides since March/April and this year our freedom from the desert dry conditions came with a bang on the Fourth of July. The rains have continued and followed along thus far on our journey. However, as hard as it has tried, it can’t rain in the caves. They can however close down several trails. Day one is implicitly full of different milestones and firsts. We are now the official co-wielders of a brand spanking new America the Beautiful pass. My first time investing in a full year pass. This year’s card has a photo that begs to be replicated. We may now get in free to every national park, monument, battlegrounds, seasides, etc. Now the parks truly belong to us. We’re ready to explore the caverns. The ever-vigilant park rangers had a few questions for us before we could proceeded. Have you been in a cave or a mine since 2005? Yes, how else was I going to capture a cave cricket for my Entomology collection? Are you wearing the same clothes/shoes as you were then? I like to get the most out of my hiking boots….so, yes. We needed to go through the decontamination process. Is this going to be like the creepy scenes from E.T.? Lucky for us, Meridith did not end up in that creepy iron lung thing (we also didn’t end up flying over New Mexico with me in a bike basket, which was a let down). We did, however, get our boots decontaminated in order to kill potential hitchhiking fungal spores. According to the National Park Service’s (NPS) website, and Ranger Val who told us all about it later in the day, between the winters of 2006 and 2007 scientists studying bats around Albany, New York started noticing a large number of bat mortalities. In 2011 the cause of death was officially traced back to the fungus Geomyces destructans which causes what has become known colloquially as White Nose Syndrome (WNS). The theory goes like this, G. destructans grows on the bodies of hibernating bats, irritating them and causing them to come out of the state of hibernation. The whole point of hibernation is to slow all of the bat’s bodily functions (ex: metabolism) down as much as possible so they can get through the winter months when food is in short supply. When bats wake up ahead of schedule, they burn off part of their precious energy stores, and, as a result, they must venture out into the cold in search of food. When you only weigh a few ounces or less, like many North American species of bat, this can be deadly. Ranger Will making sure we don’t spread White Nose. Luckily for the bats at Carlsbad Caverns NP, they are a migratory, not a hibernating, species. However, little is known about the potential of this cold-loving fungus to spread to warmer climates, and even less is known about the impacts infection could have if it did reach bats in these regions. 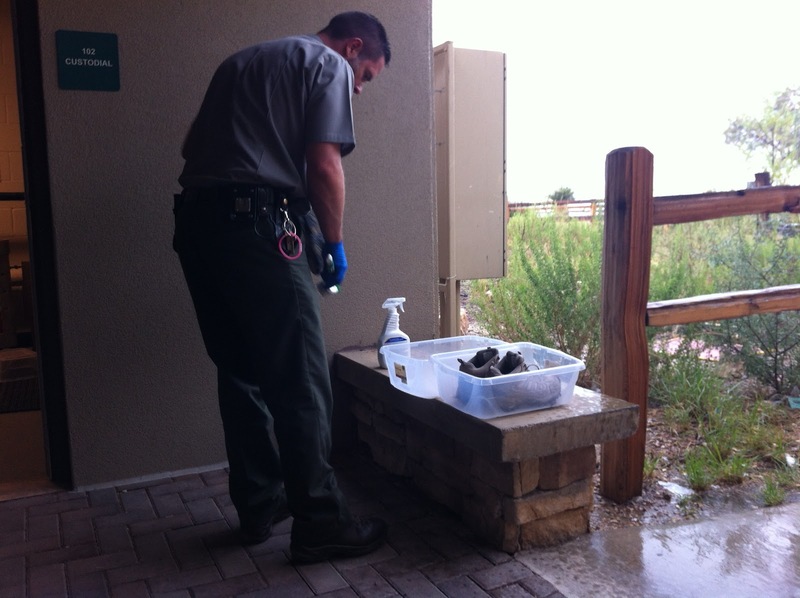 Thus, over the past few years, the NPS has adopted a White Nose Syndrome monitoring protocol as well as a prevention system. This gets us back around to our Carlsbad Caverns decontamination. When we purchased our tickets, one of the super friendly Rangers asked us if we were wearing gear that had been in any other cave or mine since 2005. I had actually just been to Mammoth Cave NP with my family the previous week, and Meridith worked on a biological preserve during college that had several caves, so she figured better safe than sorry. Luckily we had both washed our clothes since 2005, so they only had to clean our boots. We were lead outside where another friendly ranger took our boots and sprayed down the soles with 409. Yes, like what you use in your bathroom. Turns out that the ammonium solution, when left on the potentially contaminated surface for 10 minutes, does a nice job of killing stubborn fungal spores. Not a necessary step, but if you have to go through something like this with a park ranger, be friendly and ask questions. Rangers have a wealth of knowledge, and they are usually up for an informative chat. After the 10 minute waiting period, our boots were sprayed down with water, and we were clean and free to go. A final word on the decontamination process. During the fifteen minutes this whole process took, the ranger must have apologized for the inconvenience 5 times. Probably, his momma’ just raised him right and he was being polite. I personally didn’t feel inconvenienced at all. I feel so grateful for the existence of the National Parks, and if fifteen minutes of my time means some future kid gets the chance to freak out when s/he sees the bats of Carlsbad, it was more than worth it! And now we may descend into the belly of the earth to view the breathtaking display below. 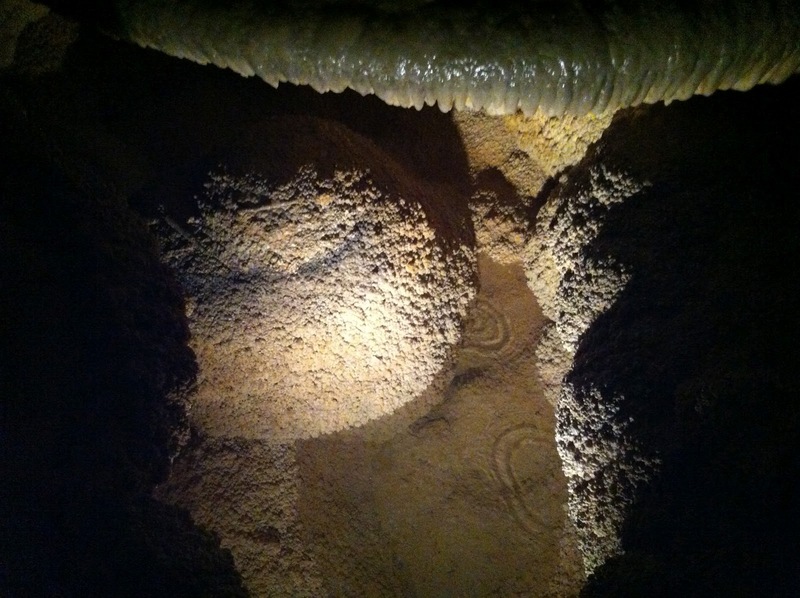 The park offers many guided tours, however we opted to explore the caverns via a self-guided route that encircled the Big Room. 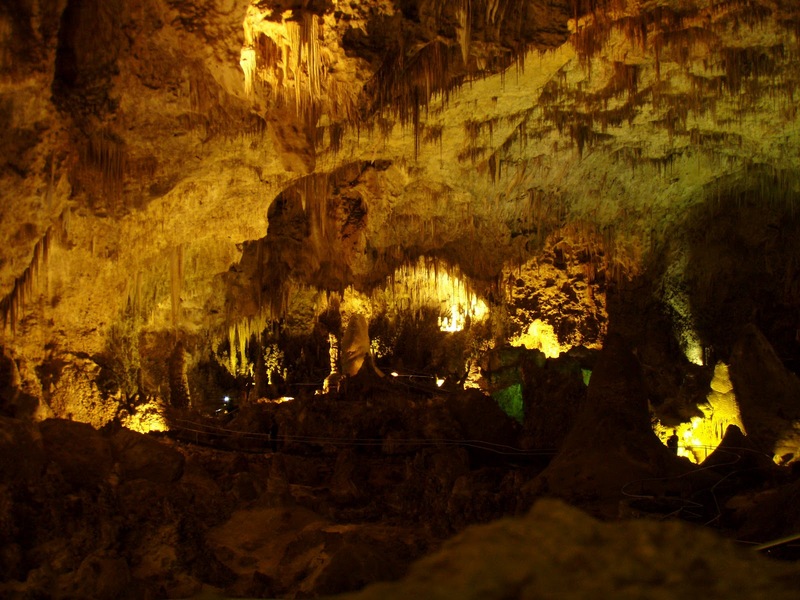 Mammoth Cave may boast the longest contiguous cave system, however New Mexico’s own system offers the largest cavern room in the Western Hemisphere. Not too shabby. I do have some speculation about what constitutes a cave room, versus a passageway or series of questionably separated rooms. It must be quite tempting to label it something grand to attract visitors. Hmmmm. Sneaky cave folk. Water drops from an active formation. I’m sure we will come to appreciate moments of downtime during our non-stop traveling, however spare time before you get to see bats in their nightly exodus can be a bit titillating. Sure, there is always something to work on. Thesis. Blog writing. Car tidying. (And let’s be honest, if we can’t keep it neat through day one, we’re a little doomed.) Eating is always a popular option. Bread needs to be eaten quickly and avocados are always calling my name. We managed to get a little of everything in. Except thesising. Day one is not for thesising. I don’t know how often you get to sit down in an amphitheater and wait for 500 thousand bats to emerge, but this was another first for me. Rachel was matching my excitement and then some. Ranger Val indeed had some jokes. Due to the rains earlier that day, it was uncertain whether the bats would actually fly tonight. A crackling bat detection system would serve as the bat announcer. Anticipation built as Ranger Val regaled her audience with bat facts, cave facts, cave swallow facts, and another lesson on White-Nose Syndrome. We waited anxiously. A young man in red hoped the gate keeping the rest of us from getting too close to the cave entrance. He did not look like a ranger, yet still had some air of authority to his passage. Val explained he was researching the cave swallows. And the bats danced out of the cave in a graceful counterclockwise spin. Circling long enough to mesmerize us, they quickly turned to fly to the Southwest in search of food. For a while there was no shortage of emerging creatures. The Brazilian (Mexican) Free-Tailed bat is a tiny insectivore, weighing in at a scant half-ounce. They winter in Central and South America before returning to the caverns to give birth. The stream of flying mammal continued, occasionally sweeping above our heads. Eventually it trickled to an end and we still sat, slack-jawed at the marvel we’ve witnessed. But we couldn’t lolligag around. The night was fast approaching and we needed to find a spot to set up camp. Back country camping is permitted in the park, but due to the rains the main road leading to the normal trail was closed. Luckily for us, Carlsbad Caverns has some of the most helpful rangers who explained that our options were backpacking off another trail in a nearby canyon and exiting the park to camp on the nearby BLM lands. We decided to follow Ranger Justin’s advice and head towards the BLM area. Bureau of Land Management handles the utilization of a variety of public lands across the nation. Camping is always permitted on these public lands. We drove up the not so aptly named Means Rd to find a suitable spot close to our vehicle. We only had to kick a few rocks away before setting up camp. Day one was already over. Have you ever visited a cave? What was your favorite part? #1 Thanks for letting ME know it didn't get in your hair. #2 Yes, I took you into Mammoth Cave your first visit there. You wanted me to carry you back up. My favorite part was the bat I saw, the one EVERYONE said we wouldn't see, didn't get in my hair either. Thanks for taking me, oh dearest mother! I'll have to take you camping for reals in exchange!